Not to be confused with the Spanish wine-and-fruit-based alcoholic beverage sangria, Sangrita (meaning “little blood”), whose origin dates back to the 1920s, is a customary partner to a shot of straight tequila blanco. Left: A glass of sangrita and a shot of tequila.. This non-alcoholic accompaniment highlights tequila's crisp acidity and cleanses the palate between each peppery sip. The basic conception of sangrita is to compliment the flavor of 100% agave tequila, which is also peppery and citrusy in taste. Traditionally, sangrita is served with tequila blanco, but it can also accompany tequila reposado. The tequila and sangrita are each poured into a separate shot glass (or caballito) and the two are alternately sipped, not chased. 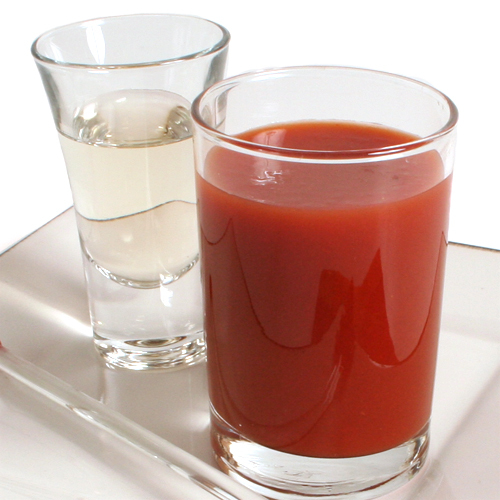 Sangrita is used in a drink known as "The Mexican Flag", where three separate double shot glasses are filled with lime juice, tequila and sangrita. Real sangrita from the Lake Chapala region of Jalisco is made with Seville orange, lime and pomegranate juices, with chile powder or hot sauce added for heat. However, many popularized modern sangrita recipes have included a good amount of tomato juice in the mix. There is no set rule on what sangrita should contain, but it can feature a blend of orange, lime, tomato and/or pomegranate juices, or pomegranate-based grenadine with the addition of something spicy (hot sauce or fresh/dried chile), and sometimes white onion and salt.